The state of Agile and Scrum understanding in organizations is not, in any way, great. Many Scrum implementations are failing not because Scrum doesn’t work for the particular organization, but because companies lack the core understanding of the Agile and Scrum mindset. 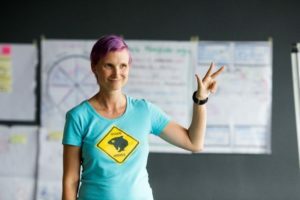 During the Certified Scrum Classes (CSM) I have taught across the world, I realized that even ScrumMasters who were supposed to be Scrum experts are often struggling with understanding the consequences. 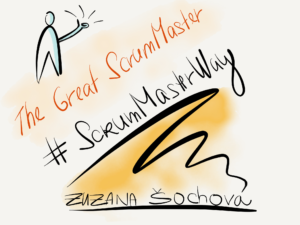 That was the key motivation for writing a book dedicated to all ScrumMasters and leaders of Agile transformation in organizations: The Great ScrumMaster – #ScrumMasterWay, which is published on Amazon. One of the concepts described in the book is the ScrumMaster State of Mind. It shows ScrumMasters how their day should look like. What are the approaches, they should use in different situations. The ScrumMaster State of Mind model defines four quadrants, with four different approaches you can decide to apply. They are all equally important and each of them can be used in all team development stages. This approach builds on top of your knowledge and experience. Especially at the beginning of your Scrum adoption journey, you have to be clear on the purpose of the individual practices. Teach individuals, teams, and organization about the mindset. In later stages, you shall share your experiences, teach new practices, and help people to improve. The second approach you can take is removing impediments. It’s critical to take off the team’s frustration, but this is not the goal of great a ScrumMaster. A great ScrumMaster is not any team assistant, so don’t take this approach too often. 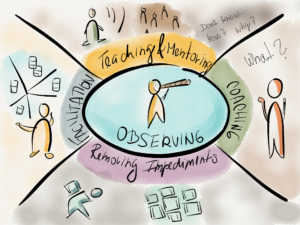 Facilitation is more than just leading Scrum meetings. As a facilitator, a ScrumMaster should know how to make conversations efficient and smooth. A ScrumMaster should know how to help people and team to agree and make a decision. The ability to facilitate is critical for team success. As the last approach, there is coaching. The fundamental difference between coaching and mentoring is that as a coach, you don’t share your own experiences, but ask questions so the team will realize where they want to go. They are the experts, not a ScrumMaster. This approach is critical to your long-term success, as without good coaching, you can never create great teams. Even though the mentioned approaches are important, there is one in addition in the middle. This middle circle is about observing and making intentional decision on where to go. It should always be your base position. The place where you start, and return back again when you apply one of the approaches, to see how it landed with a team. It helps you to react on different situations differently. Even when you make a wrong decision, and for example, teach a team who believes they know everything better already, using the State of Mind concept helps you make corrections early enough.